To illustrate the fact that the era of quackery has not gone we turn our microscope on to the Californian born iridologist, Bernard Jensen. He graduated from the West Coast Chiropractic College and whilst he made started off as a chiropractor he found fame and fortune in advancing and popularising the so-called science of iridology. The theory behind iridology is that you can diagnose disease by studying the iris, the coloured part of the eye. Jensen believed that different parts of the iris corresponded to different parts of the body and, indeed, rather fancy charts have been developed showing which part of the iris foreshadows what is going on with each part of the body. Jensen didn’t invent iridology. The first detailed explanation of the principles behind the methodology are to be found in Chromatica Medica by Philippus Meyeus, which first saw the light of day in 1665. The term Augendiagnostik was propounded by the 19th century Hungarian physician, Ignaz von Peczely, who has legitimate claims to the title of founding gather. There is an apocryphal story that Peczely developed the theory on noticing that the streaks in the eyes of a patient who he was treating for a broken leg were identical to those in an owl who had suffered a similar fate. More substance was added to the theory by the Swede, Nils Liljequist, who, suffering from enlarged lymph nodes, noticed changes in the colouration of his irises after taking various medicines. He published an atlas in 1893, known as the Diagnosis of the Eye. 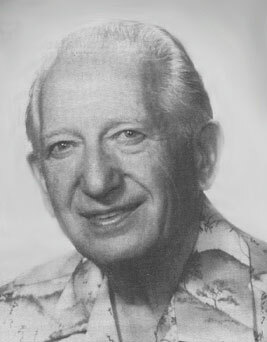 But Jensen really put iridology on the map, particularly in the United States in the 1950s when he started giving classes in his techniques. So phenomenal was his success that he was showered with awards, honoraria, degrees and was even knighted. Notwithstanding his success, there were some doubting Thomases. In 1979 Jensen and two other proponents of iridology were put to the test by being asked to look at photographs of the eyes of 143 patients and to identify the 48 who had been diagnosed with some form of kidney disorder. Needless to say, they failed the test. And that is the nub of the problem with iridology. To date, there has been no reliable clinical data to support the contention of a link between illness and observable changes in the iris. Indeed, when put to the test adherents of iridology have performed statistically no better in determining the presence of disease and identifying the type of disease than would have been the case had they been randomly selecting potential cases. The fundamental problem with iridology is that the iris doesn’t change substantially during a person’s life. The texture of the iris develops during the gestation of the foetus and remains unchanged after birth. There is no substantive evidence of changes in iris pattern other than variations in pigmentation in the first year of life and caused by glaucoma in later life. Indeed, the new biometric technology which underpins the more recent developments in security surveillance is based on the premise of the stability of iris structures. Notwithstanding all of this, there are still practising iridologists who owe their existence in large measure to the pioneering work of Bernard Jensen. At least he didn’t kill anybody! Religious schisms have always fascinated me; it is too easy to be sucked into the belief that Christianity is broadly split between Orthodoxy, Protestantism and Catholicism. One of the dominant religious groupings in Kerala , however, is the Nasrani or Syrian Christians. According to legend St Thomas, one of Jesus’ disciples, arrived in Kerala at the ancient port of Muziris – what is now Kodungallur – in 52 CE. As was the way in those days he set about spreading the word and converted a number of Brahmin families to the faith and many of the present day Nasrani claim to be able to trace their origin from those original converts. Whether St Thomas really visited the Malabar we will never know but 3rd and 4th century Roman writers give credence to the tradition by mentioning Thomas’ trip to India. The historian Eusebius reports that his teacher, Pantaneus, visited a Christian community in India in the second century. 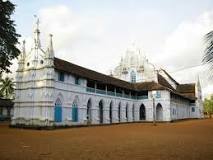 Somehow, clearly, the Malabar coast, probably as a result of its trading links with the West, became receptive to Christianity. 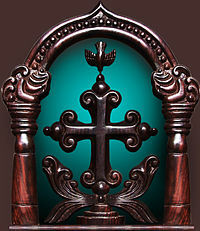 Organisationally, the Keralan Christians came under the wing of the Patriarch of the Church of the East. From the 7th century a metropolitan bishop would be appointed from Persia based in Crangamore, who would appoint bishops including a locally based Archdeacon. The Nasrani integrated themselves into local life and the Tharisipalli Copper plate dating to around the 9th century attests to the privileges and influence that they enjoyed in Malabar. All went swimmingly – the Syriacs assimilated Hindu influences into their ceremonials – until the Portuguese turned up who, in the arrogant way all Occidentals behave when confronted with something unfamiliar, were horrified at this version of Christianity gone native and stove to impose their version of Catholicism. In 1653, however, the worm turned when the St Thomas Christians in a great ceremony swore a solemn oath before crucifix and lighted candles never to accept Portuguese influence again. The so-called Coonan Cross Oath was the point at which the Syriacs regained their independence. Not all the Christians went the Syriac route which is why there is a significant Catholic and, indeed Anglican following the period of British control, presence in the area. There were many more schisms subsequently, the causes of which are too boring to relate, but suffice it to say there is still a thriving Syriac church. Services are held in the local Malayalam language and in Syriac. We visited the Champakulam Valia Palli or St Mary’s Forane Church, situated on the banks of the river Pamba and which is one of the most ancient churches in Kerala, the original supposedly founded in 427CE and the current one dating from the 16th century. The open air rock cross dates from at least 1151 CE. There are archaeological excavations underway on the site of the original church but little was evident from a cursory inspection. There was a well-attended service underway when we visited, standing room only and spilling outside into the courtyard. Women seemed to be confined to the outer reaches of the church. The church was gearing up for a major festival, the feast of St Joseph, which, inter alia, involved a large boat full of sambar, a celery-based curry, to be dished out to the congregation. A fascinating insight into part of the spiritual landscape that makes up Kerala. This was a famous club in 18th century London. It seems likely that the club was formed around 1700 and drew its membership from the leading Whigs of the time and, in particular, stalwart adherents of the House of Hanover. Their original meeting place was a rather obscure establishment down Shire Lane by Temple Bar, run by one Christopher Katt. Its principal claim to fame was its mutton pies and these became staple fare at the Club’s dinners. There is some dispute whether the club took its name from the pieman or his pies. The prologue of a comedy of the time contains the line, “A Kit-Kat is a supper for a lord”, clearly associating the name with the pie but a Dr King writing contemporaneously in his Art of Cookery sides very firmly with the pie-man, “Immortal made, as Kit-Kat by his pies”. Drinking, inevitably, formed part of the club’s activities. One of the trademarks of the Kit Kat was its splendid toasting-glasses which were engraved with verses especially composed to laud the qualities of the most prominent beauties of the day. One of the beauties thus toasted, somewhat alarmingly to modern sensibilities, was the eight year old Lady Mary Wortley Montagu. 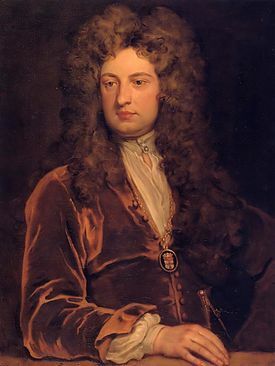 The artist, Sir Godfrey Kneller, was a member and over 20 years he painted some 48 portraits of fellow members, providing the most complete and unusual list of members that we have. Because of the constraints of size of the club room – the club had moved to the Fountain Tavern in the Strand where Simpson’s on the Strand now is and then to the home of the secretary, Jacob Tonson, at Barn Elms in the winter and to the rather racy Upper Flask in Hampstead Heath in the summers – the portraits were of a smaller size than normal, some 36 inches by 28, a format which became known as the kit-cat. Many of the paintings can be seen nowadays at Beningbrough Hall in Yorkshire. The club was also a patron of the arts. In 1709 they subscribed the sum of 400 guineas for the “encouragement of good comedies”. We could do with them now! The evenings seemed to be very convivial and once in the arms of the club, it was very difficult to extricate yourself. George I’s physician, Sir Samuel Garth, was a member, known for his wit and as a contributor to the verses which were inscribed on to the toasting-glasses. One evening he came to the club saying he must leave early as he had a list of 15 patients to visit. Once he got stuck into the vino he was reminded of the calls he had to make. In response, the wit replied, “It’s no great matter whether I see them to-night, or not, for nine of them have such bad constitutions that all the physicians in the world can’t save them; and the other six have such good constitutions that all the physicians in the world can’t kill them”. Perhaps we should leave the final words on the Kit Kat Club to some satirical verses pointed at Jacob Tonson, “I am the founder of your loved Kit-Kat/ A club that gave direction to the State:/ ‘Twas there we first instructed all our youth/ To talk profane, and laugh at sacred truth:/ We taught them how to boast, and rhyme, and bite/ To sleep away the day, and drink away the night”. Sounds good to me! Cornhill is at the heart of the City of London’s financial centre, although many of today’s masters of the universe are now rusticated to Canary Wharf. Be that as it may, the street is still full of hustle and bustle, pedestrians grimly looking at their mobile devices as they move from one location to another, rarely ever taking any notice of their surroundings. A shame really because they miss a site of real antiquity and an unusual and long-lasting form of revenge. Cornhill, as I have remarked before, is one of the two hills that dominated the City of London – the other being Ludgate Hill – before the contours of the land were masked by building development, some of it tasteful, most of the more modern incarnations, at least in my opinion, ghastly. Atop of Ludgate Hill was St Paul’s Cathedral and at the apex of Cornhill was St Peter’s Church. There are claims that St Peter’s on Cornhill was the earliest place of Christian worship in Britain. Whilst this claim is hotly disputed, the church stood on the remains of an earlier Roman temple dedicated to the goddess Diana. Nonetheless, the church has a long pedigree and, inevitably, one of its incarnations was badly damaged during the Great Fire of 1666. Although the building was patched up by the parish, it was completely rebuilt between 1677 and 1684 to a design by Sir Christopher Wren at a cost of £5,647. It was 10 feet shorter than the original, having nobly given up the space to allow the widening of Gracechurch Street. Today the church is squeezed in by shops and offices, the eastern frontage looking on to Gracechurch Street being the most impressive of its exterior sides with its five arched windows. The tower is made of brick with a small spire with a weather vane in the shape of the keys of St Peter. Unusually for a Wren church there is a screen dividing off the nave from the chancel, erected at the insistence of the William Beveridge who was rector at the time of rebuilding. The churchyard receives a name check in Dickens’ Our Mutual Friend. The battle for space between the church and the neighbouring buildings gave rise to one of the more unusual features to be found in Cornhill – its devils. In the late 19th century the vicar, upon perusing plans for the development of new premises adjacent to the church, found that the new building would intrude fractionally into the church’s land. He kicked up an unholy stink and the architect was forced to redraw the plans at cost. However, the architect got the last laugh. He added three terracotta devils to the building facing Cornhill from the south. One of the devils is in the act of spitting, one sticks up its finger in an act of rage and all three are strategically positioned to be observed by and greet the congregation as they enter and leave the church. It is said that one of the devils was based on the vicar who raised the objections. 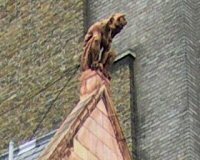 If you are ever in Cornhill, lift your eyes from your mobile device and see if you can spot the Devils of Cornhill, a salutary warning of the perils of upsetting an architect! I fielded a call from a subsidiary of the BBC the other week. At last, I thought, recognition of the mordancy of my observations and the acuity of my wit and, doubtless, an offer to be the new Jeremy Clarkson. Not a bit of it – the offer was to reprise the role of Norman Muller in Isaac Asimov’s 1957 short story, Franchise, and represent the Great British Public in a CNN International Election Debate. I accepted, nonetheless. At least it gave me the opportunity to visit the Thought Leadership Centre in the Maclaren’s Technology Centre just outside Woking – a rather austere, white-walled, multi-million pound all-singing all-dancing conference facility dripping in state-of-the art technology – the ideal location, I mused, to consider austerity Britain. Indeed, the audience’s response to the question whether we felt better off today may well have elicited a different response from a crowd seated in a draughty hall in Skelmersdale. The interaction of the audience, carefully selected by the diligent use of profiling techniques but one from a quick scan which looked to be firmly in the mature, affluent, WASP camp, was limited to responding – by tablet (natch) – to a few anodyne questions by pressing an emoticon reflecting our mood. (Before we know it emoticons will be the new form of hieroglyphs). The panel, of whom only three were standing in the election and one of those as a SNP candidate in a foreign country, were plucked from the D list of party spokespeople and only the rather bumptious and over-bearing Chris Bryant seemed capable of forming and expressing a series of logical thoughts. The Ukipper confirmed the view that cogent argumentation and party policy were two irreconcilable concepts. The recording was rather stochastic as the “debate” was halted every now and then to allow for commercial breaks, but Christiane Amanpour kept it together effortlessly – you would have thought she did this for a living – and I just about managed to escape the ever-circling arms of Morpheus. The show went out on Friday and is now condemned to an endless cycle of repeats. Still, it was my big break into the world of TV and I have played my small part in educating the world about the issues impacting the Brits and giving some poor sap stuck in a hotel room in Tashkent a nano-second of entertainment. I came across this rather tragic tale this week concerning Crawley resident, Janet Faal. She suffers badly from agoraphobia and has done so for 10 years, having only just started venturing out with the aid of a friend. Last Friday she was helping her friend reverse out of a car park and moved a wooden pallet – as you do – took a step back, you guessed it, right into an open manhole, breaking her nose and suffering a suspected fractured leg in the process. This misfortune is, she sniffed, likely to set back her recovery by years. To cap it all, the site, seemingly, belongs to the owner of JP Supplies which sells safety clothing to the construction industry. You couldn’t make it up! This was a favourite from my childhood. 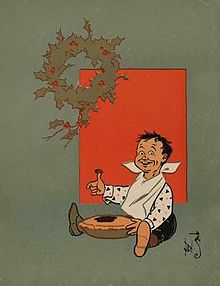 The most common modern version goes, “Little Jack Horner/Sat in a corner/ Eating a Christmas pie/ He put in his thumb/ And pulled out a plum/ And said “What a good boy am I”. If you sit and think about it – and as a small child, clearly you don’t – it is a slightly odd verse, lauding the benefits of opportunism and, possibly even, greed. The first definitive reference to a rhyme featuring Jack Horner appears in a 1725 satire by one Henry Carey – he was taking the proverbial out of Ambrose Philips who had recently published a series of infantile rhymes for children. Carey begins by saying “Now he sings of Jackey Horner/ Sitting in a chimney-corner” and goes on to recount how the youngster sticks his finger in a pie and pulls out a plum. The opening suggests that the rhyme was known to the readers at the time. That the actions of Horner were evidently associated with opportunism in the early 18th century is clear from Henry Fielding’s reference to the rhyme in his The Grub Street Opera of 1731. In his satire on then Prime Minister Robert Walpole, Fielding has all the characters trooping off to the strains of the music of Little Jack Horner. Commentators have latched on to the theme of opportunism to provide the rhyme with a back story. The theory goes that Jack Horner represents Thomas Horner who was the last steward to Richard Whiting, the last abbot of Glastonbury before the Reformation. Horner’s job was to manage the household, collect the taxes and keep the accounts, a full-time job, no doubt, because Glastonbury was the largest and wealthiest abbey in England. Henry VIII’s break with Rome in order to facilitate his divorce of Katherine of Aragon and marriage to Anne Boleyn and his need to raise some cash led to the wholesale destruction of the living and wealthy symbols of indigenous Catholicism, the monasteries. By 1639 the glittering prize that was Glastonbury had become the focus of Henry’s lieutenant, Mark Ryland’s, sorry Thomas Cromwell’s, attention. The abbot, Richard Whiting, fearing the imminent demise of his domain, despatched Horner to the king in order to bribe him to spare Glastonbury from its fate. It is said that the deeds of twelve manors were secreted in a large pie, it not being uncommon for valuable object s to be secreted in something else whilst in transit, for safe keeping. During the journey, the dastardly Horner broke open the pie and kept the deeds to the manor of Mells for himself, allegedly the best of the manors on offer or should we say the plum. The bribe of eleven manors proved insufficient to sway Henry from his proposed course of action. Worse was to follow for Whiting. He was put on trial, convicted of treason for continuing to adhere to Catholicism and sentenced to death by being hung, drawn and quartered at Glastonbury Tor – the 16th century equivalent of having to endure Kanye West at the festival this year. Horner was allegedly a member of the jury that convicted Whiting and when the abbey was destroyed he took possession of the Manor of Mells which remained in the Horner family until the 20th century. Of course, the Horner family dispute this version of how they came to acquire the manor. For those who like to gild a lily, the estate of Mells included some lead mines in the Mendip hills and, of course, plumbum is the Latin for lead. I think this is too fanciful. Whether the story of the opportunism of Thomas Horner is the true origin of the rhyme I cannot say but it offers an interesting insight into the turbulent days of the reformation. It is tempting to believe that the rationalisation is a fanciful attempt to bring a historical association to what can be simply read as a graphic illustration of a greedy and opportunistic boy.